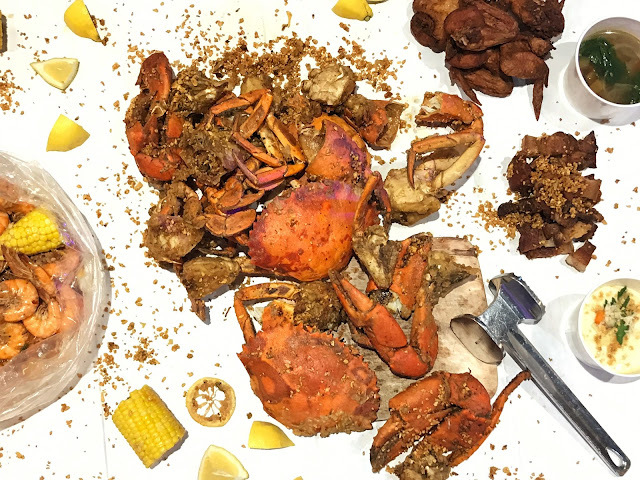 I have a love-hate relationship with crabs and shrimps. Though I love eating these delectable sea creatures, I dislike peeling or cracking off the shells. But I simply could not say no to the grand opening of a new seafood joint in Greenhills. Hello, Blue Posts Boiling Crabs & Shrimps. 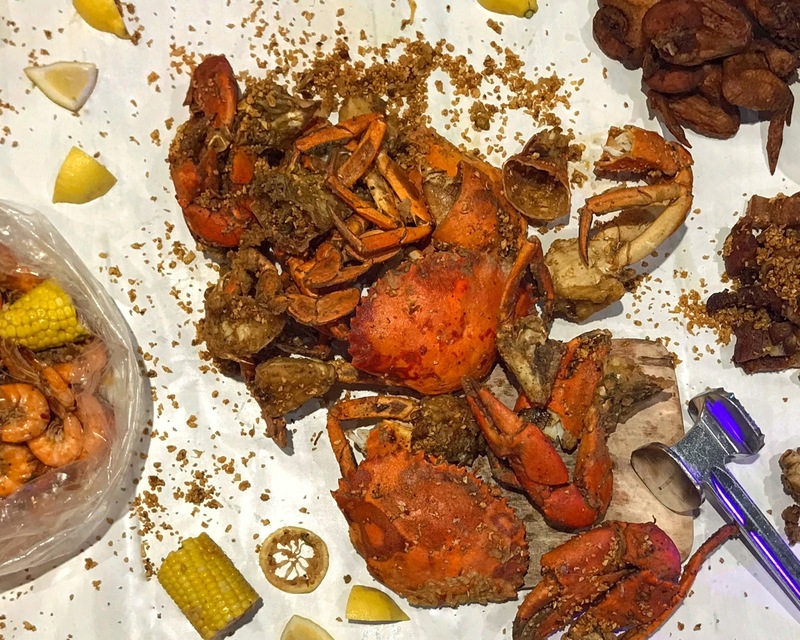 This well-loved seafood restaurant started in 2013 and was established in Davao city by a group of friends who were looking for a place where they could hang out, relax and have a few drinks. They decided to call the unwinding spot Blue Post. 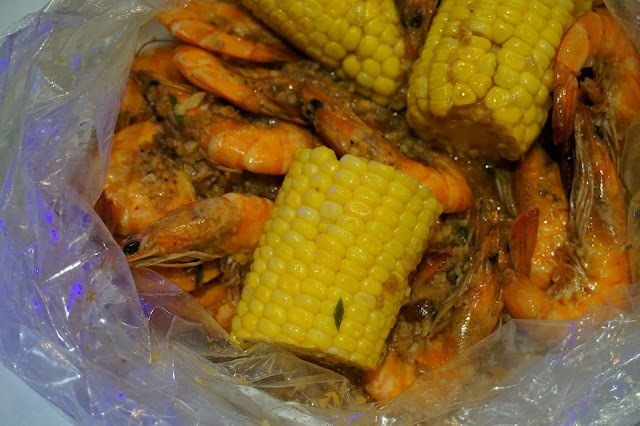 Fast forward to 2017, Blue Post Boiling Crabs & Shrimps have grown and expanded to Manila. With a whopping 2,000 kilos of crabs sold per week just in its three branches in Davao, it would be hard to deny Blue Post's success. And this is why Blue Post finally gave in to its distant patrons requests and opened its first company owned and stand alone branch in Manila (with SM North Edsa and Mall of Asia as franchises). 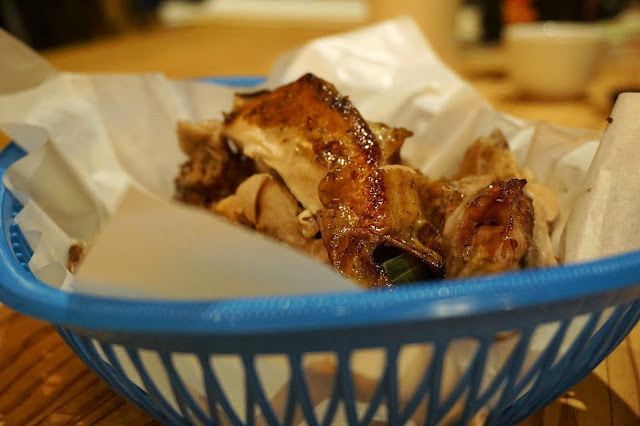 Learning the restaurant's success story made me so curious and excited to discover what made Blue Post a destination in Davao. I was already getting myself all pumped up to smash some crabs when the appetizers arrived. First served were baskets of Crab and Shrimp Roll (PHP259). 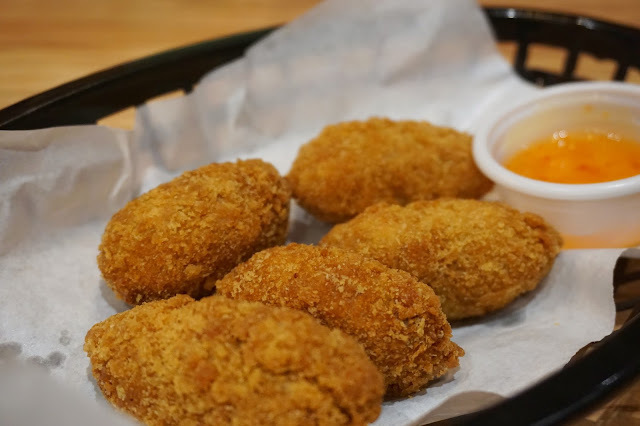 These battered treats reminded me of mozzarella sticks, only it was stuffed with minced crab meat and shrimp meat. It had a light taste perfect for an appetizer but I was hoping it would be a bit more flavorful. But this was quickly addressed by the sweet and sour dip. We were also given bowls of Spicy Beef Soup (PHP89) which seemed like a cross between nilaga and tinola. I wasn't able to enjoy this dish though as it was too spicy for my liking. 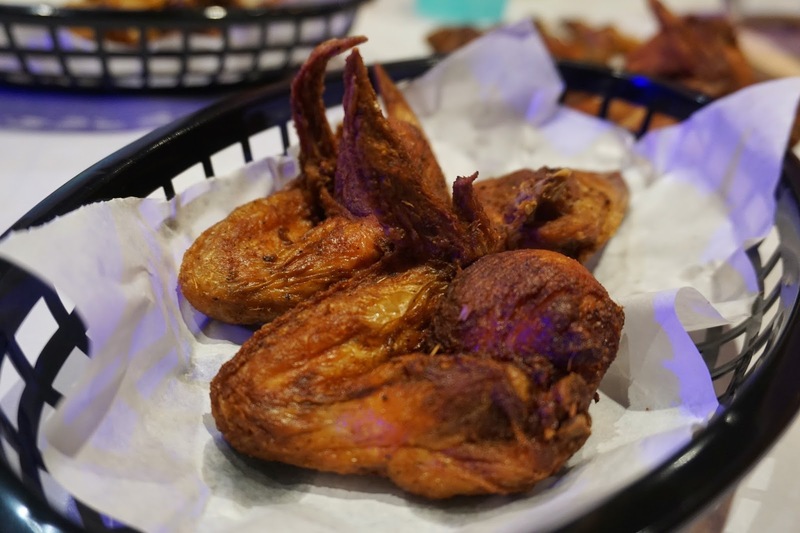 I stuffed myself instead with Fried Chicken Wings (PHP241) which were crunchy on the outside and juicy on the inside. Though the wings were quite salty, it was easily solved by rice. The Garlic Pork Belly (PHP275) was pretty good too. 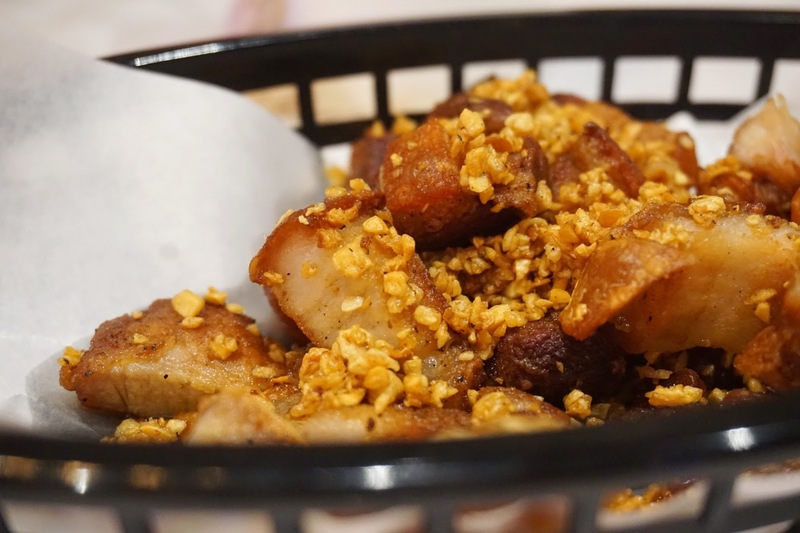 Each strip of grilled pork belly was packed with garlicky flavor! I wasn't able to try the Native Chicken (PHP389) but I heard that it was good too. Leaner than the usual chicken, this one had more bite to it. The highlights of the visit were the Crabs (market price) and Shrimps (PHP573). 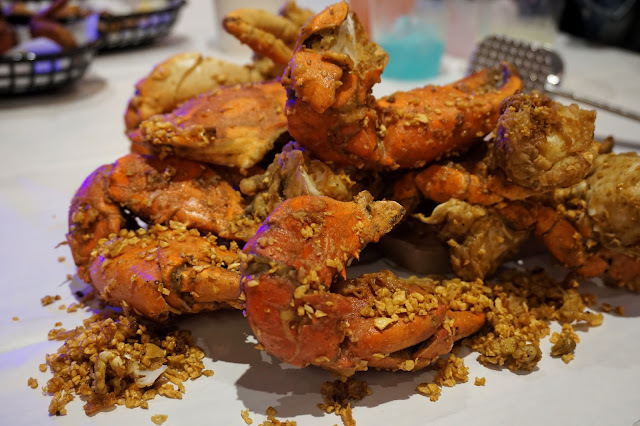 The ones served to us were Garlic Fried Crabs and Shrimps in Garlic Lemon Butter Sauce. These are also available in cajun or sambal sauce. Both deserve the Blue Post superstar status as these were stellar. Each one was flavorful and simply addicting. I might be slightly biased here though as I'm a big fan of garlic. The shrimps were undeniably fresh. 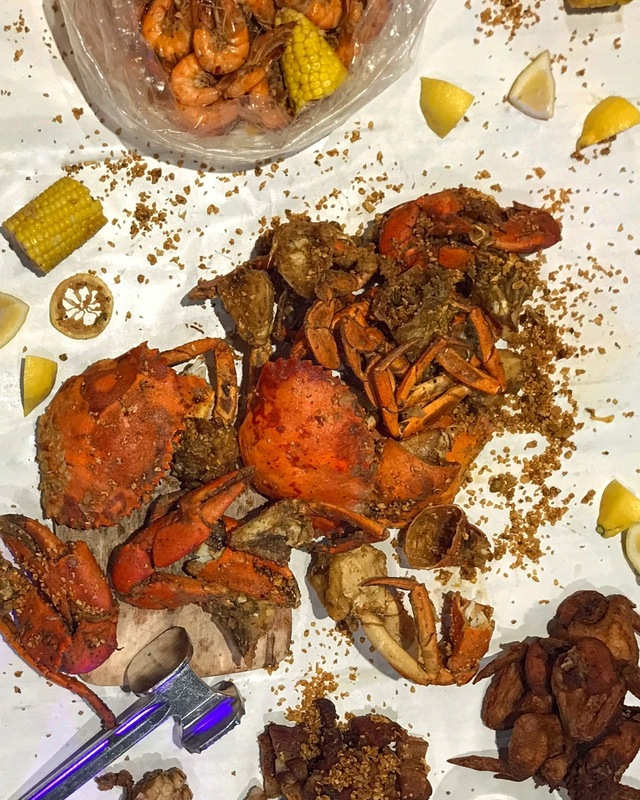 Peeling its shell off was a breeze and I love that you get a strong kick of the garlic lemon butter flavor. Blue Post made Nestle drinks more fun by allowing us to find our favorite mixes. Nestle Mixology as some call it, we blended red iced tea, strawberry, peach and all other flavors. Though some clash with each other or made the drink a bit too sweet, others tasted amazing! I played it safe though and simply combined Red Tea and Strawberry for my drink. Overall, it was a great meal and I would love to go back for more seafood. I'll definitely try the buttered cereal shrimps next time! Blue Post Boiling Crabs & Shrimps is located at O Square, Greenhills, San Juan.